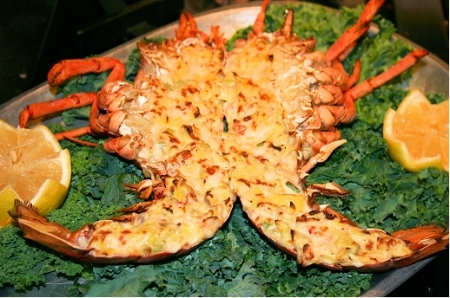 Lobster is a delicacy that is very easy to make and inexpensive to make at home compared to ordering at a restaurant. This entrée uses only the tail cut in half to share with someone special! Use the claws to create an easy and dazzling appetizer, such as Lobster Claws in a Vodka Butter Sauce. Fill a very large pot or stock pot half way with water and bring to a boil. Place live lobster into boiling water head first. Cover and boil for 10 minutes. After 10 minutes the lobster should be a deep red color. Remove from the pot and let cool for a few minutes. When cool enough to handle, twist each claw off at the base of the body of the lobster. Place claw on a hard surface and cover with a towel. Hit claw with the palm of your hand to break claw shell. Once broken, the claw meat will easily come out of the shell. Remove all lobster meat form joint and arm of the lobster. Take remaining Lobster and cut all the way down the center lengthwise with kitchen shears. Remove tail meat and carefully rinse tail meat and shell. For a step by step process of removing the lobster meat see Lobster Imperial Technique. Chop the tail into small pieces. Use the claws of the lobster for a different dish. In a mixing bowl combine chopped lobster tail, shrimp, artichokes, green onions, parmesan cheese and mayonnaise. Stir until well combined. Fill cavity of each halved lobster and place on a baking sheet lined with foil. Bake in a preheated oven at 375 degrees for 30 minutes, or until stuffing is bubbling and beginning to brown. Serve immediately. Try Rombauer Vineyards Carneros Chardonnay (California), J. Lohr Arroyo Seco Riverstone Chardonnay (California) or Ferrari Carano Chardonnay (Alexander Valley).